Solar saves the planet. And money. 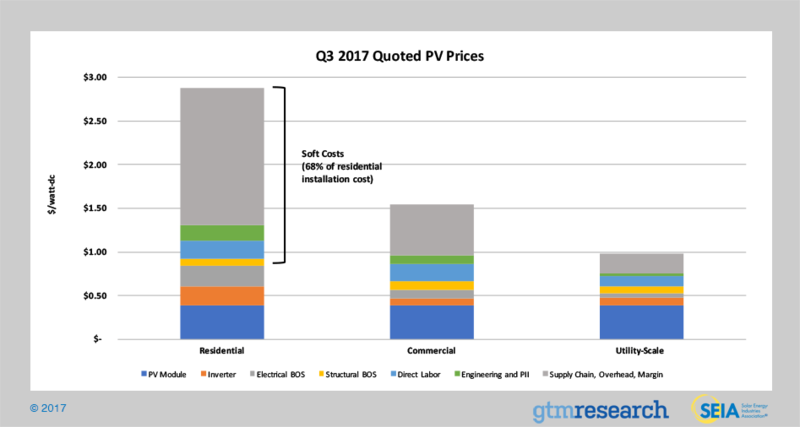 Going solar costs less than buying from the grid. Use The Wiz to find out how much you'll save. Interested in solar for your home? Good for you! Use our online solar calculator to find out how much it will save you. It's fun, it's informative, and you don't have to talk to a pushy salesperson. Go! How solar innovation is good for everyone. Since one of the primary benefits to going solar is the money it saves you on your energy bill, the cost of an installed system is the single biggest factor when it comes to folks choosing to adopt. At KW Solar, we have long believed that selling at a lower price would result in strong growth. The data from the Solar Energy Industries Association (SEIA) strongly support this. Our mission as a company is to make clean energy alternatives available to everyone. We’ve historically sold turnkey residential solar systems at a 8-10% lower price point than the industry standard. Solar panels have traditionally been the largest cost driver, but with improved technology and a maturing industry, panel price has fallen over 80% in the last decade. Due to a looming, potential trade tarriff, panel price actually ticked up slightly in 2017. At today’s prices, panels represent a small fraction of the total price of an installed system. 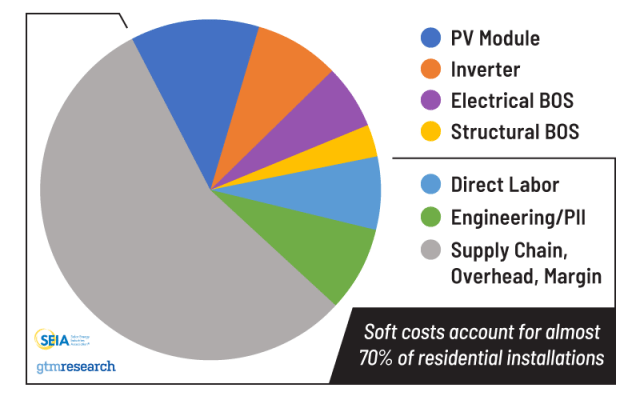 Soft costs are by far the biggest expense an installation company faces. Cost of sales, manager salaries, insurance, and other “costs of doing business” drive prices up far more than any other variable. The data clearly show that there is huge opportunity in running a solar company efficiently. Just as automation of the manufacturing process has led to a drastic decline in panel cost, automating our company operations has resulted in a much lower cost of doing business. Our proprietary technology Jigawatt delegates routine management work to computers, allowing our people to focus on what people are best at – managing relationships and continuing to innovate. 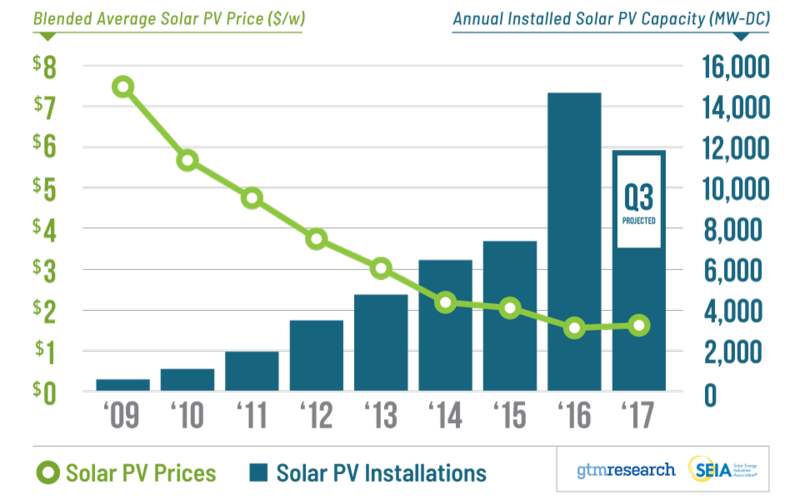 Innovation in automation has allowed us to offer lower prices to our solar customers, while keeping our company healthy and financially solvent. We’ve enjoyed exponential growth year-over-year without taking on any debt or outside investment. Solar saves you money on your energy bill. KW Solar saves you money on your solar. How much can solar save you? Questions? Call us at 832-844-5064, or email info@kw.solar.